In December 2018, Jim and I made our first trip to the city of New Orleans in Louisiana where we met up with our good friends Wallace and Lou Ann Weeks; as well as, Ron and Linda Caimano. Wallace was our tour guide and thanks to his excellent itinerary we were able to see all the main highlights in the three days that we were together. – enjoyed several delicious meals throughout the city and we shared a lot of laughs together. After three days, our friends departed for home and Jim and I stayed on for a few more days. 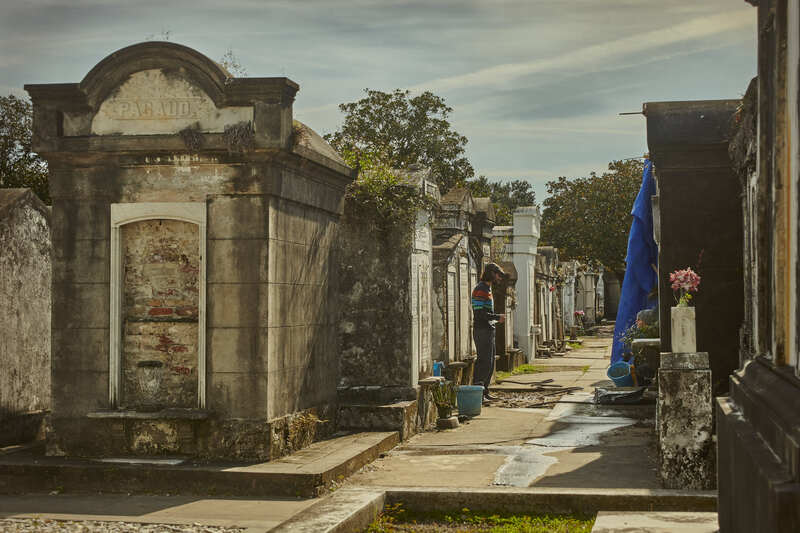 We revisited the French Quarter to focus on more photography and, on the last day, we thought it would be a great idea to visit one of New Orleans’ historic cemeteries. We decided to visit Lafayette Cemetery No. 1 as we were already familiar with the Garden District. So, why visit a historic cemetery? 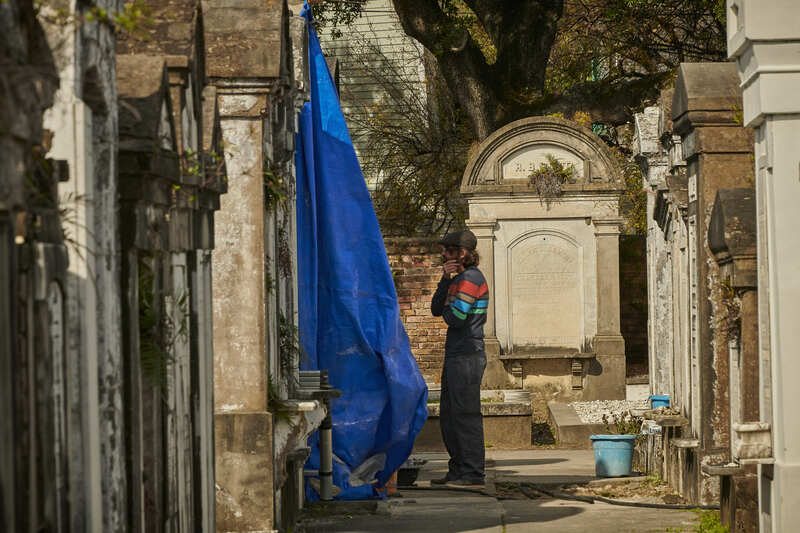 New Orleans’ cemeteries have always played an important role in the local cultural economy; however, this is just one reason that these cemeteries are important. Cemeteries, such as Lafayette Cemetery No. 1, are also “outdoor museums” where you can find an array of artistic elements such as ornamental ironwork, carved sculptures, antebellum mortuary art and a variety of architectural designs. Several of the cemeteries also have guided tours where you can learn more about the cemetery’s history and the individuals who rest there. Jim and I arrived at the cemetery just as it opened. We had read that the cemetery was quite large but we did not realize how large until we entered through the front gates. We decided to follow the outside walls and then work our way through the other rows. This was the initial plan; however, every time I went down a new row, I noticed something interesting in the next and I ended up weaving back and forth between the rows. 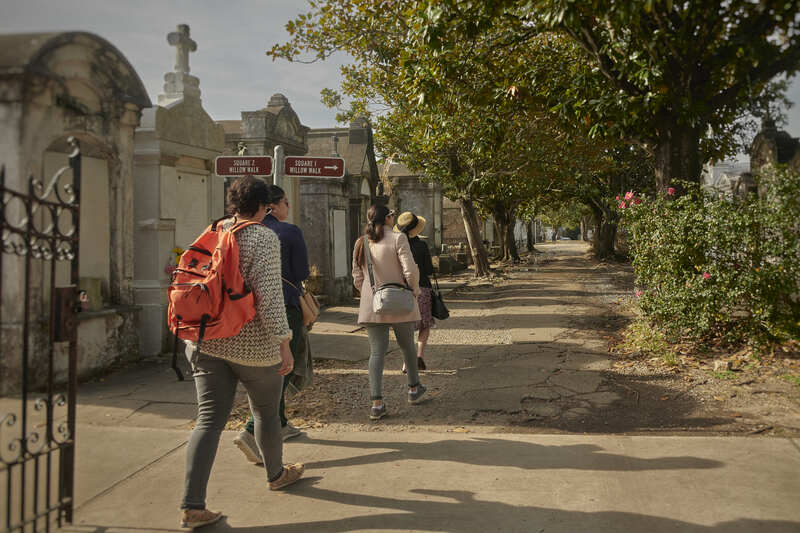 Eventually, we decided to tag along with one of the free tours to hear some of the fascinating history and stories about Lafayette Cemetery. It turns out that several films were shot in the cemetery such as: “Interview with the Vampire”, “Double Jeopardy”, “Dracula 2000”, “Deja Vu” and “Jonah Hex”. There have also been several music videos shot here by artists such as LeAnn Rimes, New Kids on the Block and The Originals. While Jim and I were walking through the rows at the cemetery, we noticed two people working on one of the tombstones. 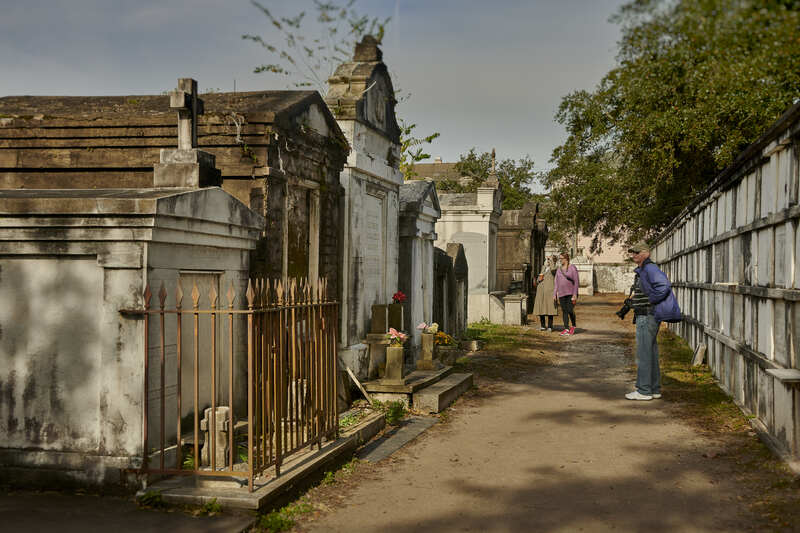 I am not sure who they were; however, I found out recently that there is an organization called ‘Save Our Cemeteries’ whose mission is to preserve, promote, and protect New Orleans’ historic cemeteries through restoration, education and advocacy. I am not sure if this was the group doing the repairs; however, they have repaired numerous tombstones and vaults in Lafayette Cemetery. For more information about ‘Save Our Cemeteries’ check out their website here. 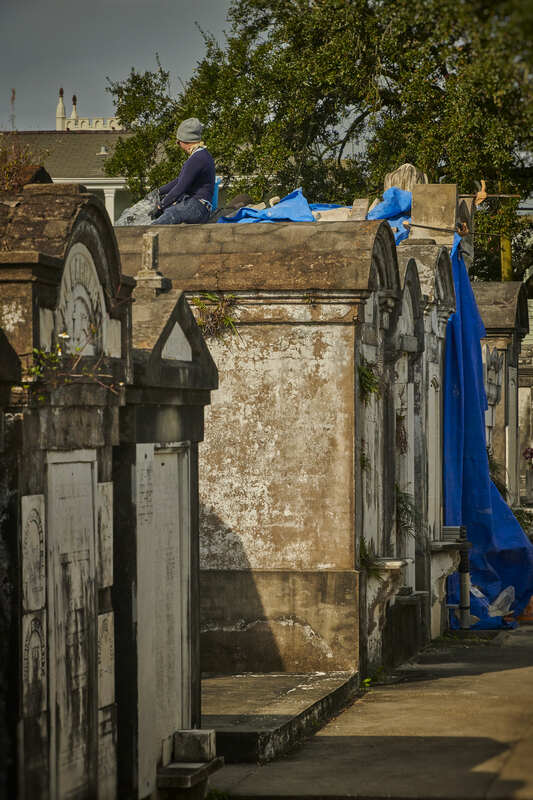 “Six cemeteries are operated by the City of New Orleans and the others are owned and operated by churches, fraternal organizations, synagogues or private corporations. The tombs and plots within the cemeteries are owned by individuals, families, burial societies and in some cases, the cemetery operator. It is the responsibility of the cemetery operators to maintain the common areas of a cemetery. The private owners are expected to maintain their respective tombs and plots. Some operating entities and families lack the financial resources, knowledge or skills to maintain and preserve these sites and structures. Also, as families disperse, fall out of contact or a lineage ends, many tombs become abandoned and vulnerable to deterioration. 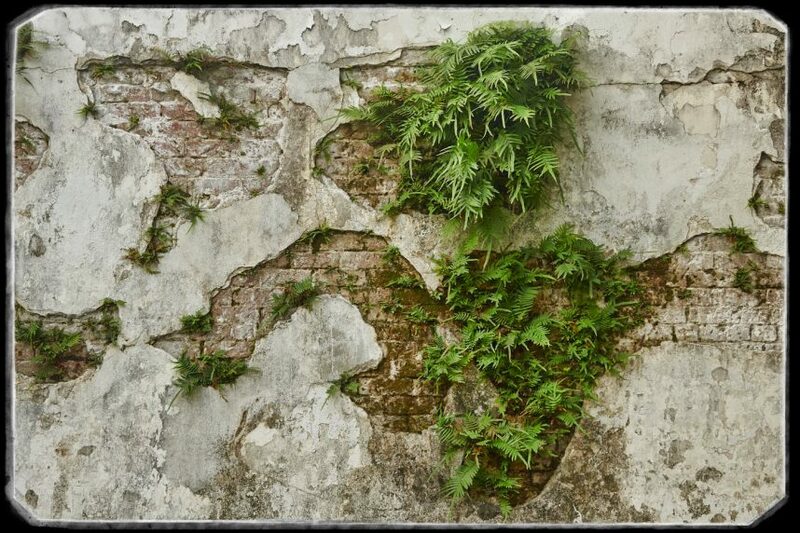 Many of the historic cemeteries are falling to ruin due to neglect, vandalism, and deferred or improper maintenance.” This is where organizations such as “Save Our Cemeteries” can help. Below, you will find a slideshow that expresses my feelings and experience while visiting this historic “outdoor museum”. The music I chose for this presentation is based on an article I read on the subject of a Jazz Funeral, also referred to as “Funeral Music”. 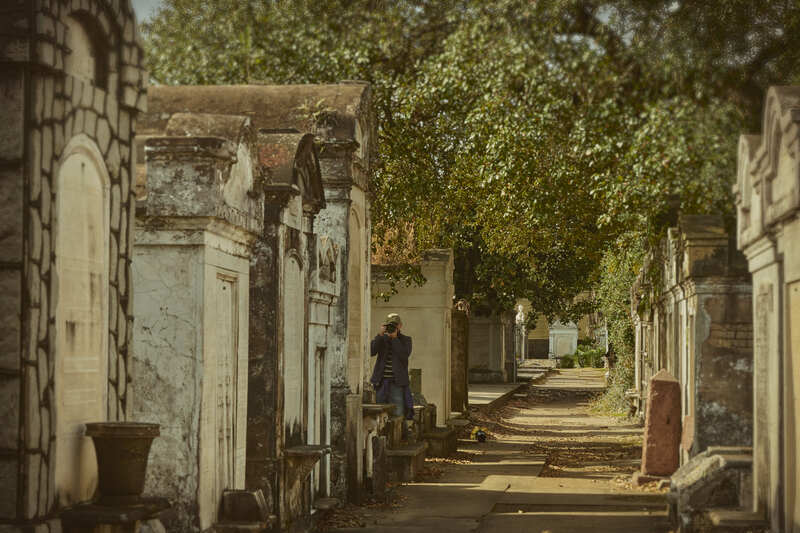 Initially, I had chosen the song “When the Saints Go Marching In”; however, it did not feel appropriate to the intent of my story which is to introduce Lafayette Cemetery to the viewer. I chose “Nearer, My God, to Thee” played by the Memphis Jazz Orchestra from their album entitled “Music Aboard the Titanic”. Jim and I enjoyed the time we spent in Lafayette Cemetery No. 1 and hope that you will consider visiting this “outdoor museum” should you find yourself in New Orleans.